The following are the top 10 principles and strategies you need to know about in order to develop and market your own successful website. But first, what is success and how do you define it? Success is a personal thing and I’m sure your definition will be different than mine. It’s something I recommend you determine for yourself before you start. In terms of websites though, consider the following statistics and if you’re not achieving these average numbers, you’re website is probably missing 1 or more of the top ten success principles or strategies in this report. One of the biggest mistakes most website owners make is that from the start, right on their home page, they flaunt themselves, their company & their products. For many business owners, it seems like the logical approach. I mean, where else are you supposed to talk about your company and products if not on your website right? Unfortunately, in most cases, this approach actually fails to produce any positive results – like getting you leads or sales or newsletter signups. To be blunt, when someone comes to your site, they don’t care about you. At least not right in the beginning. They don’t want to hear all about your success and how long you’ve been in business. They want to see the answer to “What’s In It For Me?” right in front of their eyes. “How Am I Going To Benefit From…? If they don’t find those answers within a few seconds, they’ll leave. And it’s noted that women surfers are much quicker to leave a page than men. It’s your job, right up front, to present the most important benefits of your products or services from the customer’s point of view. It’s not about you and how much work you put into the product, it’s about how the product will help the visitor, how it will improve their lives, take away their pains, and provide them with exactly the solution they wanted. If you can make that distinction in your mind and change the perspective of your website to reflect your audience and not you, you will start to see immediate benefits. People will quickly see “what’s in it for them” and they’ll be much more inclined to buy from you or take the action that you want them to take (submit a form, call-in, walk-in, etc). They will feel that you have what they want, and then they’ll become interested in you. They’ll start questioning you in their minds and wonder if they can trust you or not. At that point, it starts to become about you. This leads us to the next factor in creating a successful internet business. So you’ve got their attention and they’re interested in the benefits you’ve been showing them. Fantastic! Now that they’re excited and you have their attention, interesting questions will come up in their minds. Visitors will quickly start to question your credibility. That’s when it is ok to talk about yourself. A very good place for that on most sites are ‘About Us’ pages. If the person is ready and at the point where they want to know about you – go ahead and tell them. Tell them your story – tell them how your company first got started. It’s you chance to be personal and share a little about yourself. If you’ve been in business a while, you know what people want to know. You’re a consumer too. Once you know what a company offers, you want to know that they can back it up. You want to know what other customers have said and what their experiences were like. You want to know that you can trust the company you’re dealing with in every way. That’s what your customers will want from you too! The interesting thing is, they are much more likely to believe it if you let a customer tell them. That’s why Testimonials on websites are so effective. They shouldn’t be tucked away on a separate page but directly within the pages where you try to sell your products. Successful websites establish trust and credibility in many other ways too. One very important success factor is providing a lot of rich content for your visitors. That will help in many ways, not just for your credibility. Successful websites tend to answer the “What’s In It For Me?” question in ways that get visitors interested, intrigued and staying on the site. They understand the concept of being in service to others and they apply it to their website. Since people are hungry for information, they ensure that they provide their visitors with a lot of content that their visitors want. It seems strange to offer so much and risk not getting anything back. I’ve told many website owners to provide more content – free information to educate their interested customers. Higher Search Engine Rankings & More Listings:Search engines loves fresh, rich content and they will rank sites with a lot of good content higher than others. The more pages you have on your site also means getting multiple listings in the search engines. Keep visitors on your site longer with good content. The longer they stay interested and informed with your content, the more they will start to trust you and like you. The more they like you, the more they’ll buy from you. People prefer to buy from those they know, trust & like. The easier you make it for your visitors, the more information you can provide to those who are interested, the more questions you can answer once on your website (instead of 100 times by email or on the phone) – the more sales you will make. This factor is so important because it makes everything happen. WORDS are the most undervalued aspect of a site. It takes a lot of skill & experience to write effective copy, but WORDS have a dramatic effect on converting visitors into buying customers. Consider this, ‘Every Time A Visitor Comes To Your Website A Sale Is Made’. That’s a fact! 100% True. Either way, a sale is made. Successful websites use the Power of Words to attract their visitors, keep their interest, increase their desire, and make them take action. Through effective sales copywriting. Copywriting is Salesmanship in Print. What so many websites miss is effective sales copy to sell (help people buy) their products. Many would say that copywriting is a part art, part science. I like to think of it as more science than art. People act in predictable ways and it is the job of your sales force & your website to understand how people think, feel & act. With websites, we can constantly measure, test and improve on our results in a scientific, methodical manner. Sometimes all that is needed to turn around an underperforming website that gets targeted traffic is to change the copy bit by bit until the visitors take the action you want them to take. It has been proven, time and time again, that the more interactive a website is, the more engaged a visitor becomes, the higher the likelihood that a sale will be made. How do you interact with visitors? You need clear Calls to Action. Calls to action are typically “buy now”, “subscribe”, and “download” links – the things you want the people who are visiting your site to do. These are the keys to unlocking the actions you want visitors to take. It’s amazing how many sites don’t do this well and how simple it seems on the sites that do it well. Even the sites that do a good job of putting the action links in obvious places sometimes make the mistake of expecting too much of visitors. “More info” and “details” links are often missing, and the user is expected to click on the picture or product title. You’d be surprised how many potential customers give up and move to the next site. By giving customers instructions on things you want them to do – you will increase your results dramatically. Sometimes just changing a “More Info” link to “Click Here to Learn More About ….” will increase success rates by 100%-500%. Other ways and reasons to interact with your visitors goes back to the psychology of selling. When visitors are interested in your words, the best way to get them to take the ultimate action of buying your product is by starting out with smaller requests first. If you can get a customer to take a poll on your site, submit a form, answer a survey and show them the results, they will feel valued. By interacting with your visitors and making them feel valued, they will in turn want to reciprocate. With their mental objections slowly being lifted away, action by action, they will feel more inclined to keep going forward and to eventually be convinced that their next step is to buy your product (or sign up for your service or any other action you want them to take). For more ways to interact with your visitors and consider the Lifetime Value of a Customer, please continue reading. Successful websites consider the Lifetime Value of their Customers and realize that much more profit lies ahead with every purchase they will make in the future. How do you get a visitor to be a life long repeat customer? You can do it all through email. Even many offline businesses use the power of email marketing and maintaining a relationship with their customers to their advantage. Most times a visitor won’t buy from your site on the first visit. Many times, they will never even find your site again. So it’s absolutely critical that you give it your best attempt to capture their email address right away and start fostering a long term relationship with them from the get-go. Via email you can build rapport with your visitors and customers and establish even more credibility over time. But, you have to get them to sign up to receive your messages first. Once they sign up, you can follow up with them by automatically sending them messages that you pre-wrote. You only have to write the messages once and they will be automatically delivered to your customer/visitor in the sequence that you defined. Successful websites do this flawlessly. With each email they slowly build trust, rapport and they slowly build a long term relationship. This translates into much higher earnings than by focusing only on one-time-only customers. Taken from the Pareto Principle it is said that 80% of your income comes from only 20% of your customers. Therefore that’s where you should be focusing most of your time and energy. By building a long term relationship with website visitors and customers, you will enjoy repeat business that you didn’t have to search for. They already trust you and are now more likely to buy from you again than choose to research the market and buy from a stranger. The subject of Website Traffic is still something very misunderstood by most website owners. A website needs traffic but more importantly, it needs the right kind of traffic, to generate significant results. It needs the kind of traffic that really wants what you have. Many website owners don’t realize it yet but they think they can just build a website and start making sales from day one. Of course you know that’s not true. You’ve probably heard a bit about Search Engine Optimization or Search Engine Ranking Improvement already. Why all this talk about Search Engines? Because, search engines are the #1 place people go to find what they want. Getting in to the top 10 results for the keywords your visitors use to find your types of products is the goal of every successful website. Search Engine Optimization is a very complicated way of improving your site’s ranking in the search engines. The higher your rankings, and the more listings you have, the more traffic you will get. Search engines work in complex ways to provide their users (your potential customers) with the best and most relevant results. They constantly change their rules on how they rank a website, which makes it hard to constantly optimize your site. Many businesses spend thousands of dollars a month with optimization specialists. Unfortunately, things don’t always work out as you’d hope. One day someone who’s held the #1 spot for their keyword, for 5 years, all of a sudden vanishes completely from Google. It’s a fact that happens every day and it crushes many businesses. 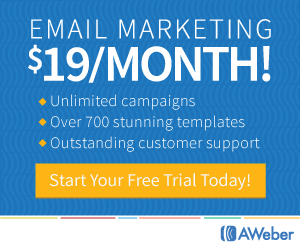 Email Marketing with existing Customers! Successful business do at least two of the above really well and continue to find more ways to reach their target markets. Many companies hire a web designer or web development firm to build their website. They considered that enough of an expense and they’re not willing to invest more until they see what happens. So, the web design firm uploads the site, the job is complete and the company waits to see what happens. Aside from wanting to grow and profit more every year, you want to protect your enterprise from competitors. You want to keep pulling visitors in, getting their attention, interest, desire and getting them to take action with you. There’s always going to be another website coming up from behind and you better watch out or you could lose your piece of the pie! How can you get a bigger piece of the pie? How can you dominate your market? Read on to learn more about Joint Ventures & Affiliate Marketing. Most successful websites have strategic alliances and do joint ventures with other popular and successful websites. Let’s consider that each website has its own community of subscribers/customers and there comes a point when you can’t sell them more of your products to your list than they need. Successful websites leverage the power of other successful web communities to expand their reach. Let’s say you’ve tested and improved to the point that you can’t sell more of your own products to your customers (for the time being until they need more or you acquire more customers). What do you do now? What if you had someone else’s products to offer them? Your subscribers/customers know you and trust you. If every once in a while you sent them a compelling email, telling them how they could benefit from your partner’s ‘Product X’ or ‘Service Z’, you could earn a commission on every sale made that originated from your email. Or you could charge a fee for every email sent. Ultimately you want a Win-Win. Your ally gets more sales, you get a commission. Or vice versa, if your ally has a list of 20,000 targeted people, you could offer her a flat advertising fee or a commission on your products. Websites exchange traffic and send out email promotions to their partners all the time. When done properly, tactfully, and always remembering to be in service to your visitors, joint ventures can increase a websites business by 1000% or more. Once several joint ventures have been made and your site is a proven seller, you can recruit an army of affiliates to promote your products to their lists. Read on to learn how affiliates can multiply your business every day. Once a site has reached a high level of trust and online popularity, when a few successful joint ventures have been done and when you know your site sells, that’s when you want to find a handful of super affiliates. To understand the concept of Super-Affiliates, you first need a firm grasp of Affiliate Marketing. Successful websites understand the power of Affiliate Marketing and they use it to reap enormous rewards. Affiliate Marketing simply involves allowing other website owners or marketing-savvy internet users to promote your products by offering them a commission for every sale they generate on your site, or every qualified lead they bring you, or every click they send to your website. Affiliate Marketing is a modern twist on paying finder’s-fees to someone who brings you business. The most attractive aspect of affiliate marketing, from your vantage point, is that with this Pay-for-Performance model, no payment is due to an affiliate until results are realized. Your affiliates send visitors to your site using a variety of promotional techniques including banner ads, text links, referral emails and so on. These are all tracked by software and tied in to your shopping cart. Almost every website can run an affiliate program. Some website owners choose to outsource the complicated tracking and payment through a 3rd party known as an Affiliate Program Provider. Examples are Commission Junction, ClickBank, Linkshare and there are many others. Now if all this sounds too good to be true, hold on to your seat. It’s 100% true but it’s not as easy as it sounds. You may be thinking that the affiliate’s job is easy and that they can generate a lot of sales for you every day. It’s not easy at all. Only a handful of your affiliates will generate consistent sales for you every day. Only a very small handful will be able to produce enormous amounts of sales, faster than you could ever imagine. These are your Super-Affiliates. Super-Affiliates are their own business – they have their own list of subscribers who trust them and will take them up on their recommendations. Some Super-Affiliates have lists bigger than the Merchant’s own list. When they send a promotional endorsement to their list, watch out, make sure your shopping cart can handle all the sales. This concludes your Sneak-Peak into the “The Business Owner’s Internet Marketing Basics Guide”. In the upcoming full version, each Success Principle & Strategy is expanded in its own fully-detailed section. By applying its simple and effective strategies, you will convert your site from No Sales to The Internet’s Next Website Success Story. Thank you! Wishing you the success you deserve!